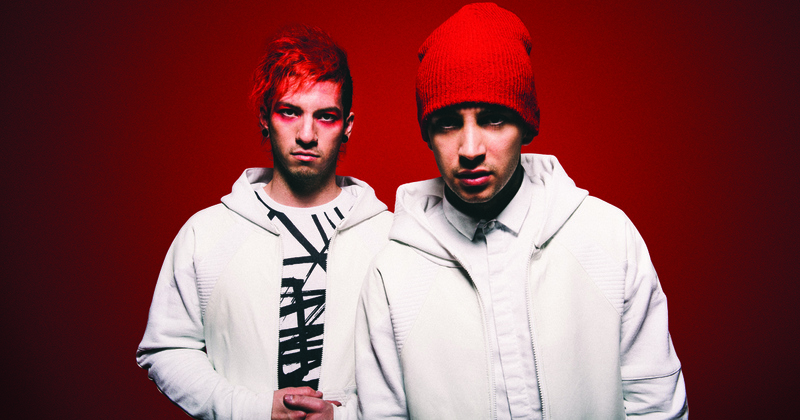 If you aren’t already familiar with Twenty One Pilots, then one watch of their video for their single “Stressed Out” may be enough to turn you into a fan as well as cause some serious envy of their secret handshake skills (#goals). The band’s latest album, Blurryface, topped the Billboard 200 after its release in May and the duo has become regulars at this summer’s hottest music festivals. Although the duo has gained a multitude of recent success, they’ve been at it for years, self-releasing two albums. Tyler Joseph originally formed the band in 2009 with college friends Nick Thomas and Chris Salih. Joseph named the band after being inspired by the moral dilemma a character in the play All My Sons faces after he is responsible for the death of twenty one pilots during World War II. The band began touring throughout Ohio and released their debut self-titled album on December 29, 2009. Thomas and Salih left the band in 2011. Drummer Josh Dun then joined Tyler Joseph and the duo self-released the album Regional At Best. The duo signed with Fueled by Ramen and released their third album, Vessel, on January 8 2013. Vessel reached the No. 58 spot on the Billboard 200 as well as No. 42 on the Digital Albums chart, No. 17 on the Internet Albums chart, No. 15 on the Rock Albums chart, and No. 10 on the Alternative Albums chart. The band performed at Lollapalooza and Bonnaroo in 2014 before kicking off the Quiet Is Violent World Tour. When writing songs for Blurryface, Joseph and Dun zeroed in on what they thought their set was missing while on tour promoting Vessel. The duo researched and worked with a variety of producers in order to combine strengths on a final product that delivers just that: the best of many talents. Although fans have labeled their genre “Schizo Pop”, the sound on Blurryface could be described as the best of the chill sound of Chrub and Rebelution, with the playfulness of Sum 41 and Blink-182, and even a faint nod to the Beastie Boys. More succinctly, the album could be described as the perfect soundtrack to round out summer.